How have your lives changed since signing with Sony? Narelle: It’s gotten a lot busier, there’s a lot more responsibilities and a lot more people you’re accountable to. Jon: I think productivity level increases a lot. We not only have a team here in Singapore that works on our stuff, it’s all the affiliates in the region as well. Because of that, everybody wants something from us – you end up doing a lot of things you don’t even know what it’s for and where it goes but we know it’s in safe hands. Ben: You get a very strong sense of perspective – not just in music but in music business – you realise that there are things you need to be fretting about & things you DON’T need to be fretting about. Now that you’re working with people you can delegate work to or get work delegated to you. Everyone plays off their strengths and you know the bigger perspective of what needs to be done. It’s a good thing. Narelle: At the same time, I feel that my world has gotten a lot bigger – there been a lot more doors that have been open that I would never have dreamed of and it’s like ‘oh yeah, that’s alright, we’ll get things done’. And you’re in a totally different head space & your goals have completely changed as well. I like it – it’s a great place to be. What were the differences between recording your first EP and the new album, Take Heart? What has changed? Narelle: You know a lot more – definitely feel more confident. You make better decisions. Me especially, I was so confused, I didn’t know what was going on (the first EP) – I never recorded a thing in my life. So it’s really good to feel when I step in (the studio) that I know what to do, what I want to achieve and I can see everything forming nicely in front of my eyes. Ben: From a musicality standpoint, we are a band but we also have separate interests. Let’s face it, we are a pop act – we do commercial music and we want to be as relatable as possible. That being said, this kind of music is something that resonates with all of us – it’s not something that we feel we have to put out. We all feel passionate about writing music that relates to a large group of people. So, I think all the creative decisions for this album was directed to this end goal. I mean, the previous album was a mixed bag of genres & it was also our first go at these things, but you hear in terms of the writing – it’s really for this purpose. And we love it. Technically, the album is a step up – you can hear the production quality has increased. And the writing as well, we’ve tried to make it something that resonates with us still but it’s also very palatable to a large audience. Sandra: Also the recording from the EP, when we went in to do the EP, we didn’t know what we wanted – the Willows sound – that was something we were really struggling with as well but over the course of the three years, we have been playing a lot of the songs that were in the current album. So when we play it live – we first thought about how it’s going to sound – but it evolved as well. When we went into the studio, we knew how we wanted the songs to sound – so I guess it was a lot smoother – the recording process and how it evolves, to take the next step from a live recording to a studio production. There’s a very strong sense of ‘heart’ in the (new) songs – from your perspective, if there is a theme running through the album, what would it be? Ben: OK, this is something we don’t talk about a lot – it is a pop album but when it came together, we realised that the songs that we were writing were all about a couple who are in love and it’s all situated around this fictitious village and this couple is being expunged from the village. So, this is the narrative that all the songs circumvented. But again for us, we get moved very intensely by works of art and so for us, it was about trying to bring out this emotion. 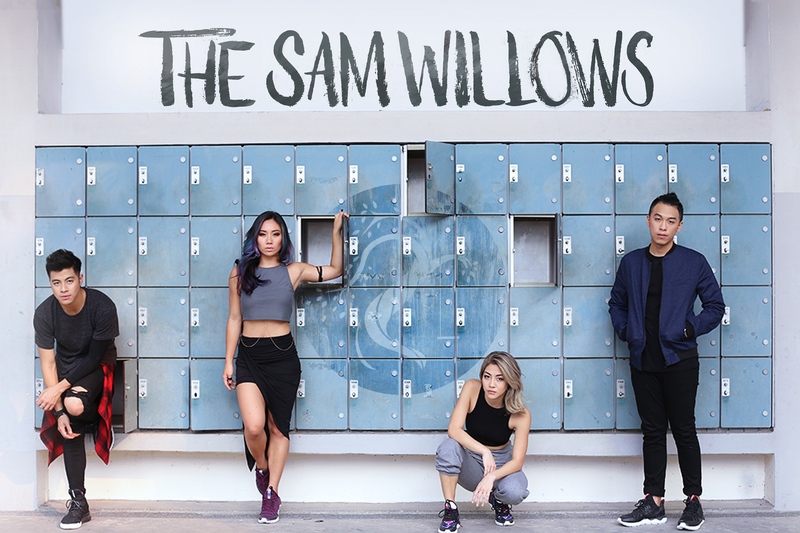 What is the best part of being The Sam Willows? Sandra: For me, I love creating music but I think who you do it with is very important – it’s like being in a relationship, right? When we create music, we build our relationship together. Cuz when we go out there and do our own things – we come back, we bring in new information & experiences and that helps to grow and our music also evolves from there. Ben: Also, reaching out to people you never expected to. Nowadays, we get a lot of young kids – 8 or 9 – coming up to us and saying that they are inspired by this and that. It’s cool to be able to reach out to that age group. I have been following (The Sam Willows) for some time and what I’ve always liked is that you have always tried to use your influence in a positive manner – how important is that to you? Jon: I think being in The Sam Willows is the privilege to be a voice of change and a voice of influence. So as a band I don’t think we go out so far as to say – we are here to make a change – but rather we wanna do it through our music and through whatever we do in the public eye. So the best part of being in the band is being able to write music and perform music that influences people in a positive way. And positive in the sense that (people can say) “Singapore music is actually pretty good”. Not just The Sam Willows but also there’s Gentle Bones and Charlie Lim and Sezairi – the list just goes on. I think that if we can bridge that gap then – that’s an achievement to us. The Sam Willows’ Take Heart is now available digitally globally on all digital platforms and physically in Singapore (Starbucks, Topshop, CDrama), Malaysia, Hong Kong, Australia, and more. Thanks to Sony Music Singapore for making this interview possible.